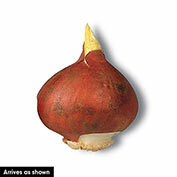 Greigii Tulip Pinocchio | Gurney's Seed & Nursery Co. Stylish Tulips with an Easy-Care Nature! Tulips with a unique sense of style give early- to mid-spring gardens a touch of form, color and flair. Showy flowers are bright red with pure white edging and a vivid yellow base—highly visible, even from a distance. Planted in groupings, both large and small, creates a well-designed display in sunny borders, rock gardens, naturalized areas and decorative containers. Even the foliage catches the eye—broad, grayish-green leaves are marked with deep maroon stripes. Pinocchio is an easy-to-grow variety that requires only light deadheading to keep the blooms coming. 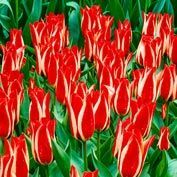 It's no wonder this tulip is an award winner! With its good looks and carefree nature, it's a longtime favorite in gardens across the country. Zones 3-8. Color: Scarlet-red with a white edge and lemon-yellow base. Flower Form: 3 - 4 inch blossoms. Comments: Classic! Large, scarlet-red with a white edge and lemon yellow base. An exciting show of color and shape for your garden. 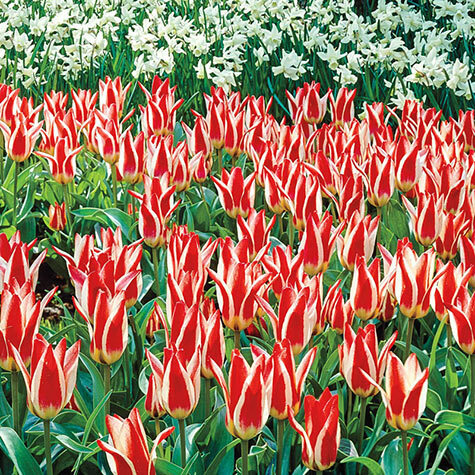 Flowering early in spring, Greigii Tulips are beautiful in large groups and can be left to naturalize and multiply to produce magnificent masses of flowers year after year. Greigii Tulips have beautifully mottled foliage making them attractive even when they're not in bloom-wonderful additions to beds, borders and rock gardens.